Simply put, yes, seniors are using medical marijuana in ever-increasing numbers. Those aged 50 or over in the US are starting to use marijuana more and more in states where medical marijuana is legal. Of course, we’re trying to elevate the conversation here at Dr. Frank’s, so we’re going to not only explain the reasons why this is the case, but also critique and question the simple “yes” to the question. Just because marijuana use is increasing among seniors, it doesn’t mean that they are the main users. Those under the age of 50 are still the main consumers of cannabis, although marijuana use tripled among those aged between 50 and 64 and increased tenfold among those aged 65 or over. The one obvious reason why marijuana use is increasing among those over 50 is because they are more likely to suffer from conditions that could benefit from marijuana use. Whether it’s arthritis, cancer, multiple sclerosis (MS), irritable bowel syndrome (IBS) or inflammation (and lots of other conditions besides), you’re more likely to suffer from it the older you get. As marijuana has such a broad spectrum of medical use, one plant can either replace or reduce intake of several prescription medications, most notably powerful and highly addictive painkillers such as vicodin. The other reason why marijuana use is increasing among seniors and the elderly is because it’s losing many of the stigmas attached to it. As the research behind marijuana sheds more light on its potential benefits, many who may have held anti-marijuana stances in the past are essentially starting to “see the light” and question the notion of marijuana being a “drug”. Reefer clearly doesn’t lead to madness, regardless of what the propaganda of the past tried to propagate. 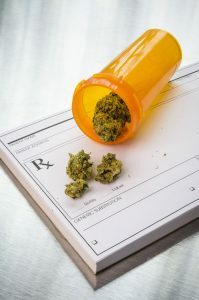 The concept of marijuana as “medication” is gaining significant traction, and in many cases was already used medically in synthetic form before medical marijuana became legal (e.g. Marinol, Dexanabinol). Another thing to remember about the “increase” of use amongst the older segments of our society is that some of them were already users, it’s just that they developed conditions that allowed them to successfully apply for a medical card. They are probably also more likely to admit using marijuana as it becomes less taboo and legalized. Many of them grew up in the 60s and 70s, after all! As the baby boomer generation gets older, the laws and policies that get voted through start to reflect attitudes that differ significantly from previous generations. Also remember that seniors are one of the biggest voting blocs of pretty much every western society, especially as the population ages. Not only is the research so far suggesting (or in some cases outright proving) that marijuana has a huge number of medical applications, but the actual science and technology that goes into marijuana growing and use is improving significantly. We shall explain why this is important for seniors (and others) below. One of the main barriers to marijuana use – by seniors or otherwise – is because of its traditional route of administration: smoking. Regardless of the medical applications, the health-conscious were never going to embrace this aspect of marijuana readily. For those suffering from, say, cancer, the concept of smoking marijuana to relieve symptoms can seem a little backward – smoking anything can be harmful to health and contribute to the development of cancer, after all. In the past, edibles were the way to avoid the smoking aspect of cannabis use, but measuring strength this way was (and still is) far more difficult. Bongs were another potential, but were not necessarily much better for the health than a joint. Then, as marijuana for medical use became more and more commonplace and people wanted smokeless alternatives, vaporizers became de rigeur. Vaporizers opened up the marijuana market to not only seniors with health problems, but also to athletes and a youth who are moving away from tobacco use. Scientific advances have made it possible to breed strains specifically for medical purposes, making it more socially acceptable. The other area where science and research has improved cannabis for medical use are the actual genetics of cannabis itself. In the past, many growers were on a THC hunt. Then, as the evidence for the potential benefits of CBD, CBN, CBG, THCv, THCa, myrcene, linalool and lots of other cannabinoids started to come out, growers started to focus on breeding strains with higher concentrations of these compounds. This eventually led to CBD-heavy strains, which provide many of the anti-anxiety, anti-inflammatory and anti-nausea aspects of medical marijuana, but without the “high” associated with THC. This cemented the idea of marijuana as medicine, and is definitely one of the drivers towards making marijuana use as “acceptable” by seniors and those who may have criticized its medical applications in the past. Perhaps one of the little-thought-about things of the future marijuana is this: one day, it might become a medicine used mostly by those aged 45. “Why?” You may ask. Well, if one looks at marijuana use in countries and states where it’s legal, usage tends to drop and stabilize. This means that those who use marijuana when they’re younger tend to stop using it after several years (the “I was at college” effect), whilst others tend to carry on with occasional or regular use. Should such trends occur throughout the US, it would not be surprising to find that, in several decades’ time, marijuana’s main users are seniors.